This Gospel Book was written on the Continent in the 10th century, but reached England fairly soon thereafter, as shown by textual additions ranging in date from the 10th to the 15th century, which relate to Thorney Abbey, in the Fenlands between Peterborough and Wisbech. As the note in the upper right corner of the upper pastedown informs us, this manuscript was bought in 1692 by Sir Thomas Mostyn, and was no. 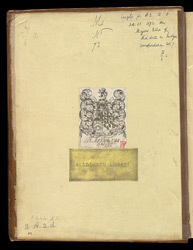 22 in the catalogue drawn up in 1744 by his grandson, also called Thomas, whose bookplate is attached, along with the label of his library at Gloddaith (or Gloddeath), near Llandudno in north Wales.